These fall into the final category. I've had a half-used bag of mini Reese's taking up space in my small makeshift dorm pantry (really just a glorified cabinet in what's supposed to be my closet space) since about September. It was time to get rid of those suckers. I've also been craving monster cookies lately. (Oat-y, peanut buttery, M&M and chocolatey goodness. What's not to crave??) So I decided to combine these two agendas. I guess that means these cookies really fall into two categories of invention: craving AND I-just-want-to-stop-looking-at-these-dang-Reese's-already. I decided to solve my surplus Reese's problem by hiding them inside monster-sized monster cookie cups. Kind of like the baking equivalent of cleaning your room by shoving all your stuff under the bed and hoping your mom wouldn't notice. But I'm sure you never did that, because you were the model of childhood obedience. Right? Right. ;) So kind of just like that...only better. Because Reese's certainly make for a better surprise when your secret is (inevitably) discovered. I'm pretty sure this one will earn you hugs, not scolding. I used Sally's soft-baked monster cookie recipe as my base. It turned out well enough, but I would have liked more oats to give the cookies extra substance and general oomph factor. The Reese's in the middle, though...now that (to toot my own horn) was inspired. That nugget of peanut buttery/chocolatey goodness made the cookie. Sinking your teeth into a mouthful of peanut butter, oats, mini M&M's, and Reese's is a one-way fast route to your happy place. Guaranteed. Whatever your reason for making this recipe, I'm sure it's a good one. And if you don't already have a reason, here's a fool-proof one: Just because. Preheat oven to 350F degrees. Grease a cupcake pan. In a large bowl, using a hand-held mixer or stand mixer with paddle attachment, cream the butter and sugars together on medium speed, about 3 minutes. Mix in the peanut butter, egg, and vanilla (in that order). Scrape down the sides of the bowl as needed. Slowly mix in the baking soda and flour. Do not overmix. 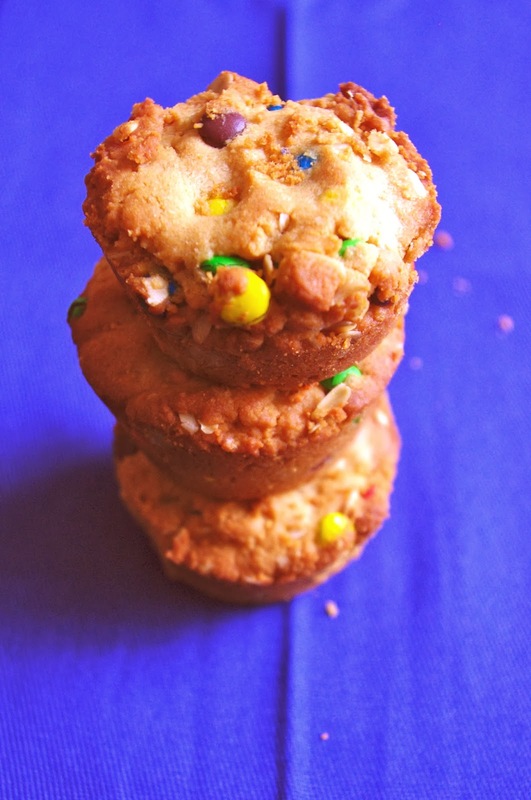 Fold in the quick oats, M&Ms, and chocolate chips. If the dough is very soft and unmanageable by hand, chill the dough for 30 minutes before rolling. Line the bottom of the cupcake cups with cookie dough. Place a Reese's inside. Cover with enough dough to conceal Reese's. Bake for 10-14 minutes, or until just browning. (Keep an eye on them!) Allow cookies to cool completely before removing from cupcake pan. Enjoy!